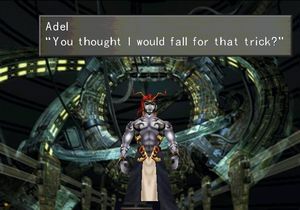 Adel is a sorceress and minor antagonist in Final Fantasy VIII. There is a great deal of debate about this character’s gender identity. Adel has a very masculine form, but is referred to with female pronouns throughout the game. Players have read this character as a cisgendered woman who is meant to look “disfigured,” a transgender woman, and a cisgendered man whose gender was swapped in translation. This entry was posted in 1990s, Characters, Gender non-conforming on December 10, 2015 by Adrienne Shaw.